Omniflex specialises in remote monitoring solutions, based on years of plant networking experience from last mile networking to mainstream Ethernet backbones. The Teleterm range specifically addresses the remote outstation issue by providing a programmable platform based on IEC61131 languages for control and networking options from low grade cable to radio and GSM infrastructure. Wireless distributed PLCs with inherent data acquisition capability are an attractive proposition against cable-based systems. • Flexible configurable I/O analog and digital. • Ethernet and wireless ports. • Local logging on SD cards. • Small DIN rail mounting. 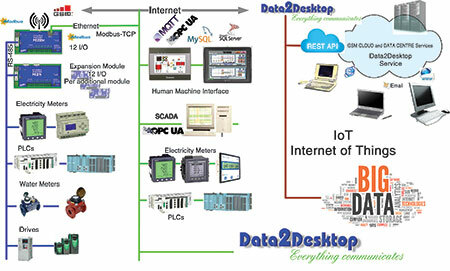 • Modbus and Modbus TCP as standard. • Licence-free band wireless PLC units. • Wi-Fi and HMI solutions. • GSM IoT PLC units. • SMS, email and data transmission.